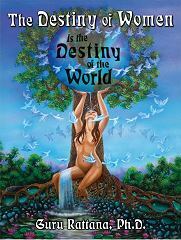 This e-version of Guru Rattana's ground-breaking book, The Destiny of Women is the Destiny of the World, has unique and invaluable content with the potential to uplift every woman on the planet. Within its 314 information-packed pages (printed version) it encourages every woman to celebrate her womanhood, with effective ways to elevate her consciousness, unleash her creativity and live her dream. It is for EVERY WOMAN who wants to unlock her inner strength, dignity, radiance and grace, and for EVERY MAN who wants to understand and connect with the feminine essence. The Destiny of Women is really about the destiny of humanity. This exciting book shows both men and women how to honor their feminine side. This is the key we need to fulfill our highest personal visions and to create a sustainable global future. - Kenneth J. Roberts, President, New Futures World Marketing.